Empire of Corpses and Steam-Powered History | Anime etc. As the film Empire of Corpses opens, a steam train chuffs before Saint Paul’s Cathedral. A caption reads, “London, 1878.” Then we’re in a Frankenstein-style laboratory where a young man forces a metal helmet over the head of a waxy-skinned corpse. Cogs whir in the helmet’s workings, while the man drills a surgical instrument into the nape of his dead friend’s neck. A “computer,” made of thousands of bits of whirring metal, extrudes a pile of punch-cards. The man, in time-honoured horror film fashion, throws a hefty switch; all round, valves glow with blinding blue light. The man removes the helmet from the corpse, peers into its face, and says softly, “Start Up.” There’s a pause, and the dead man’s eyes open. Empire of Corpses is a new cinema film by Studio WIT (which made Attack on Titan), being released on Blu-ray and DVD by Anime Limited. It’s a prime case of anime steampunk – steampunk being a genre that’s grown very popular in recent years, though its roots go back even before 1878. And there were steampunk anime before steampunk was fashionable, and before steampunk was called steampunk at all. In this article, we’ll define steampunk more loosely. However, even if you can’t count some of our examples as true steampunk, we hope you’ll accept them as interesting cousins and variants. Empire of Corpses is clearly steampunk by most measures, with the film’s opening moments establishing that we’re in Victorian London with an alternative technology. Later in the film, we get such staples of steampunk stories as sinister, beautiful, overbuilt machines that turn out to be superweapons, as once dreamed by writers like Jules Verne and Arthur Conan Doyle. Empire of Corpses also features an appearance by one of steampunk’s most beloved machines, the Nautilus submarine, created by Verne in his 1870 novel Twenty Thousand Leagues Under the Sea. 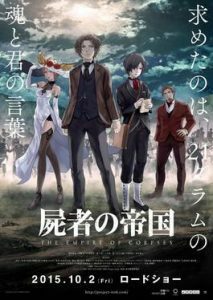 And then there’s the outrageous, very steampunk idea suggested in Empire of Corpses’ title; namely, the British Empire relying on the manpower of artificial zombies, people brought back to life by Victorian industry at its most blasphemously warped. One of the main inspirations for steampunk is the science-fiction of the nineteenth century, future visions by artists of the past. Twenty Thousand Leagues is one of those visions. Verne’s novel imagined advanced submarine vessels, quite impossible when the book was written (though a crude sub had sank a Confederate ship in the American Civil War six years earlier). Before Empire of Corpses, Twenty Thousand Leagues was reimagined in anime in 1990 as the epic Gainax serial Nadia: The Secret of Blue Water, available from Manga Entertainment. In this often brilliant series, by the future Evangelion creator Hideaki Anno, the Nautilus battles for humanity against the terrorists of Neo-Atlantis, who wield weapons that could end the world before the twentieth century. Nadia is often called a lighthearted show, and much of it is, but its best episodes show what steampunk can do at its finest. The story is seen through the eyes of two children of the nineteenth century, the girl Nadia and the boy Jean. Jean is an inventor who’s thrilled at the wonders of technology, the way it can build a better world. You can imagine his reaction when he boards the Nautilus. But we slowly realise that the Nautilus crew, including its commander Captain Nemo, aren’t anything like the children. Rather they see technology from our perspective, a modern one; they’ve seen the “wonders” of science blast cities to ash and kill loved ones. (Remember, this is a Japanese series.) Much of Nadia hinges round the tensions between the children’s and adults’ views, which makes for great science-fiction and an intelligent commentary on science-fiction, past and present. As many fans know, Nadia was inspired by a never-made storyline by the young Hayao Miyazaki (Spirited Away). Arguably Miyazaki’s own first steampunk works were the episodes he directed of Sherlock Hound, a British-Italian kids’ series made in 1984, which is also available from Manga Entertainment. One of Miyazaki’s first episodes, called “The Little Client,” has a superb steampunk joke. As the story starts, Sherlock Hound – who of course is Sherlock Holmes as an anthropomorphic dog – is riding through London with Watson – another dog! – in a lever-driven car. Like Empire of Corpse, there’s a prominent shot of Saint Paul’s Cathedral to set the proper tone. Then – good heavens! – a pink pterodactyl descends on London, squawking at all and sundry. “It’s some prehistoric creature!” exclaims Watson. “Prehistoric nothing,” retorts Hound, “that’s a plane!” And so it is, with two goons standing in the cockpit, one of them squawking through a loudspeaker. It’s a hilarious scene, but it’s funnier if you’re geeky enough to spot the reference. In real life, Sherlock Holmes was invented by the British author Sir Arthur Conan Doyle. Among Doyle’s non-Holmes books was The Lost World (1912), about explorers finding dinosaurs in South America. At the end of the book, the heroes bring a pterodactyl to London, where it causes uproar (though in a seminal 1925 film version, the pterodactyl is upgraded to a Brontosaurus which knocks down half the city). So the Sherlock scene is a joke about Doyle, dinosaurs and the madness of disguising a plane as a pterodactyl. In other words the pterodactyl scene is fanservice, in the unsexy, geeky sense of the word, for lovers of vintage literature and the history behind it. The steampunk genre is full of spot-the-reference fanservice; Empire of Corpses bursts with it. You might guess that from the fact that the film’s hero is named John Watson, even if he doesn’t have a friend called Sherlock Holmes. (You have to wait until after Empire’s end credits to see more characters from the Sherlock universe reveal themselves). Empire of Corpses also features the Frankenstein monster – actually two different versions of the monster. The film offers both a bitter, loquacious philosopher monster inspired by the “Creature” in the 1818 Frankenstein novel by Mary Shelley, and a hulking dumb giant from the Hollywood Frankenstein movies. Empire’s other “borrowed” characters include Alexi Karamazov (from the Russian novel The Brothers Karamazov by Dostoyevsky), Nikolai Krasotkin (ditto), and a British Secret Service official called ‘M,’ who’s presumably the forerunner of James Bond’s boss. This M has a Moneypenny too! Later we learn M’s real name is Walsingham, a name alluding to Francis Walsingham, a spymaster for Elizabeth I in the sixteenth century. Meanwhile, the name of Empire’s heroine, Hadaly, alludes to an android woman in an 1880s French novel, The Future Eve, which was also referenced in Mamoru Oshii’s cyberpunk anime, Ghost in the Shell 2: Innocence. A supercomputer in Empire is named “Charles Babbage,” in honour of a very real British mathematician. In our world, Charles Babbage conceived of a computer in the early nineteenth century but never actually built it. Naturally, steampunk writers ask what would have happened if he had, as in the 1990 novel The Difference Engine by William Gibson and Bruce Sterling. 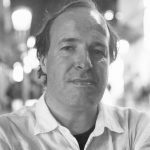 Empire also features real people in its story, giving a major role to Frederick Burnaby, who was a legendary British army officer and adventurer. There are also historical look-ins for Seigo Yamazawa, a celebrated Japanese soldier; for the great inventor Thomas Edison, who gave us the electric lightbulb; and for the ex-US President Ulysses S. Grant. All in all, Empire of Corpses has the maddest anime character list since Horizon in the Middle of Nowhere gave us a magic girl Shakespeare and a Ben Jonson (playwright) looking like Ben Johnson (athlete). Steampunk fans, though, will take the madness of Empire of Corpses in their stride. Steampunk is about mashing things up like lego: Victorian values and super technology, waistcoats and flying goggles. Empire of Corpses follows a steampunk tradition of taking the literature and heroes of past centuries and reworking them in modern style. Nadia is another example, reimagining Jules Verne; so is Miyazaki’s Sherlock Hound,doggifying Sherlock Holmes. Another case is the anime series Gankutsuou: The Count of Monte Cristo,available from Anime Limited. Directed by Mahiro Maeda, the serial retells the 1845 French novel The Count of Monte Cristo by Alexandre Dumas, but turns it into a steampunk space-opera. Most of the series takes place in a fifty-first century Paris which is remarkably similar to the nineteenth-century city, down to the characters’ aristocratic costumes and conduct; the stone buildings; the opera houses; even the horse-drawn carriages. But the horses in Gankutsuou are robotic, young aristocrats holiday on the moon, duels are fought with bif robots, and the French army wages war in deep space. If Gankutsuou transposes nineteenth-century Paris into a space opera, then Steamboy, transports nineteenth-century London into a modern blockbuster action film. Directed by Akira’s Katsuhiro Otomo, Steamboy has set-pieces like a troop of British bobbies fighting soldiers in steam-powered armour outside Crystal Palace; later a gigantic steel fortress hovers over the capital. Instead of boring car chases, the chases in Steamboy involve giant mechanical unicycles and monster steam engines. The last images of the film go outside Victoriana, as the hero acquires a jet-pack. The high-flying finale seems to borrow from the spectacular Superman cinema cartoons of the 1930s. These same cartoons also influenced Miyazaki’s Laputa: Castle in the Sky,which he made a couple of years after Sherlock Hound. Miyazaki’s other steampunk opus is Howl’s Moving Castle, although some critics may complain that Howl has too many wizards and spells to be real steampunk. (It’s also set in an imaginary world, though modelled closely on the Alsace region in Europe.) But Howl’s stupendous flying vessels, which look like hybrids of machines and living organisms, are absolutely steampunk. In designing Howl’s mecha, Miyazaki was inspired by a nineteenth-century French artist, Albert Robida, who drew both wondrous future inventions and terrible future wars. Another great borderline steampunk anime is the epic Fullmetal Alchemist. Again it’s set in an imaginary world, but one that’s full of historical resonances, with steam trains and a Germanic military which salutes its “Fuhrer” leader. The crafted cybernetic technology called “automail” has steampunk written all over it. Even if you complain that the world of Alchemist runs on magic, this is a magic that the heroes treatas science, based on quasi-science principles. Alchemist’s famed Law of Equivalent Exchange is based on a fundamental principle of true science (the First Law of Thermodynamics, which says energy cannot be created or destroyed, only transmuted from one form into another). Such twists on reality are what make steampunk popular.